When we lived in Andorra a friend of mine had a long-standing, continuous argument with the green grocer near her apartment. The produce was never fresh. There was a lovely market just across the border in Spain twice a week. It was only about 10 miles from the border, but with the hordes of shoppers in and out of Andorra most days, it could be a horrendous trip. The little grocer was just down the street. The problem was clear to her and anyone familiar with Economics, 101. She just couldn’t convince the owners. It was this: the lettuce, fruits and vegetables that were on the sidewalk for sale were old, wrinkly, gone off, wilted. In the back there was new, lovely, fresh, crisp produce. She could see it. She just couldn’t get to it. The owner wouldn’t move the good stuff up front for sale until the old stuff sold. But the old stuff never sold because it was, well, old and awful. Eventually, it rotted and got thrown out. Now the stuff in back could be moved up but by this time it was old, wrinkly, over-ripe, wilted. When it was moved up new fresh produce replaced it in back, waiting it’s turn to wilt and be moved up front for non-sale. Obviously they sold enough of the old veg to keep their shop open. We assumed it was bought by the old, black-garbed widows, to make soup. We know it wasn’t sold to the young, health conscious vegetarians for salads! Soup, like any, other food, can benefit from fresh vegetables, but it has long been a dumping ground, a ‘just before the compost pile’ place to put the last odd bits lurking in the fridge or root cellar. All that being said, I planted too much lettuce! I didn’t plant more than normal but it was way too much for the cool summer we’ve been having. It just keeps growing. I’m convinced that Jesus fed the hordes with loaves, fishes and lettuce! What to do with too much lettuce? Before it hits the compost pile? You could pick a bouquet of it for a centerpiece. Lettuce is full of fiber, has vitamin C, beta carotene, folic acid and potassium, all good for the heart, blood, arteries and useful in maintaining low cholesterol. The darker and more colorful the lettuce the healthier it is. All colors of romaine (I have the typical dark green plus a deep red and a mottled red and green) are especially full of nutrients while the old restaurant standby, iceberg is probably the least. I like planting a mix. 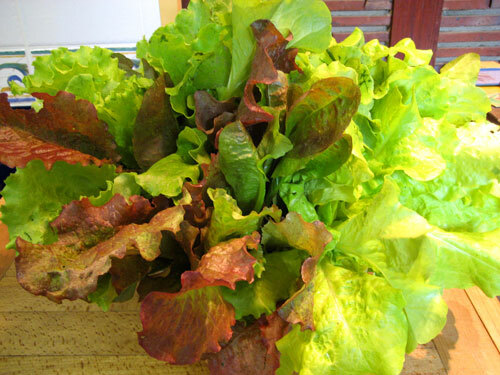 The photo is of mixed leaf lettuce. It’s getting ready to bolt but the mixed romaine is just reaching perfect picking size so we’ll be in salads for some weeks to come. Chop shallot and potato. Heat oil in saucepan and sauté shallot for 2 minutes. Add potato, stock and bring to a boil. Cover and simmer 15 minutes. Chop or shred the lettuce. Snip tarragon. Uncover the saucepan and stir in the lettuce and tarragon. When lettuce has wilted (almost immediately) remove from heat and purée in a blender. Set aside to cool to room temperature or refrigerate for colder. Fry bacon until crisp. Remove, drain on paper towel and crumble. When ready to serve ladle into bowls, dollop 2 tsp of yogurt onto each serving, sprinkle with bacon, basil and serve. Note: This soup can be made ahead and served cold, straight from the fridge. Note 2: When I made this I didn’t use potato but thickened it with 1 tbs cornstarch (like I do Hot and Sour Soup). I think the potato will smooth out the flavors and give a better ‘feel’ to it. Don’t forget to visit Food Blogga on Monday for Susan’s recap of what’s cooking around the the veggie/herbie world! I love this novel idea! 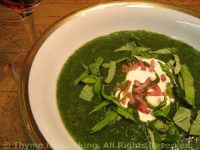 I’ve never made lettuce soup before but would certainly like to try it, especially with tarragon. In case you’re still looking for more ways to use up your lettuce, here’s a simple yet tasty suggestion. Just saute romaine with garlic and olive oil, add it cooked pasta, top with lots of Parmesan, olive oil, and crushed red pepper. It’s always been a family favorite, and it takes 5 minutes to make.Thanks for the delicious and informative entry to WHB, Katie! Yum!! That looks delicious. I always remember the first time I made braised lettuce, after reading a recipe for it in The French Chef by Julia Child. It was greeted with shock by some of my friends. Cooked lettuce?? Horrors! :):) It was wonderful, of course. Your lettuce is really gorgeous. I never manage to plant lettuce since it needs to get in the ground during the end of school rush where I’m overly stressed and haven’t gotten to the garden yet. But I do think lettuce fresh from the garden is a thing to be thankful for. So it seems you are being blessed too much! What a good problem to have, as my mother used to say. I’ve hard about lettuce soup but haven’t tried it. But I did see the word tarragon there, and it caught my attention. I recently discovered stir fried lettuce, too. With lots of garlic, a bit of ginger and soy, lettuce cooked over high heat in the wok is an amazing taste, like an entirely new vegetable. Try it! Katie the lettuce looks wonderful. I had much lettuce but is about gone now because it is getting too hot for it here. I am hoping to wait a month and palnt more for the fall. Maybe I can try your soup then. It sounds great. We are a day ahead but will drink French Wine today. Champagne would be good!!! 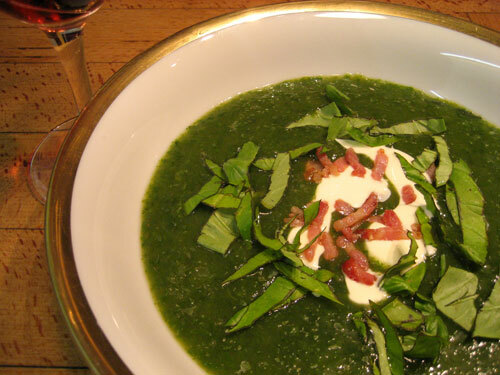 Pille, it was good… I was a bit skeptical but I love spinach soup… I’m glad I tried it. 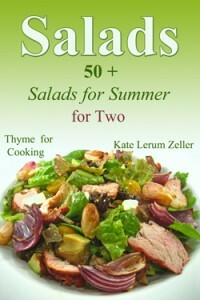 Sher, my mother always made ‘Wilted Lettuce’ with lots of bacon fat and onions… (how can that be bad?) I was used to ‘hot’ lettuce! Kalyn, yes, the magic word: tarragon! Mine has finally taken off so I can use it with abandon! Oh, and about the “greengrocer” — what a stupid way to do “business”!?!?! Funny to read about but not so nice to have to frequent the store. Cyberdelia, I thinks it’s a wee bit too warm for lettuce – great for beaches, though… can’t have everything! Your herb garden is coming along nicely! Lisa, those people drove us nuts. My friend even offered to pay more for the good stuff in back…no! Lettuce soup…who would have thought? That actually sounds really good! Everyone has lettuce and why not try this with the discarded outer leaves? Kristen, it actually is! And not so different from spinach soup! Peter, better than the compost pile – at least occasionally! My grandmother made the most fabulous wilted spinach with bacon salad there ever was. Katie you lettuce is super beautiful looking. I have none growing in Texas. Betty, thank you so much, vous etes tres gentile!